I recall the image that comes to mind of Jesus as he stopped on a hill overlooking Jerusalem and wept. Though the situation in the region from New York City to Hoboken is not the same as Jerusalem, I suspect it still moves the heart to tears. Stories are beginning to emerge as more and more of the devastion is revealed from the impact of Hurricane Sandy. The work of supplying immediate aid is clearly complicated as responders and agencies are limited and frustrated by damage to infrastructure and local resources. Church World Service's supply of clean-up buckets has been depleted and they need more. We are challenging ourselves as a Conference to supply 1000 Emergency Clean Up Buckets to Church World Service during the month of November. 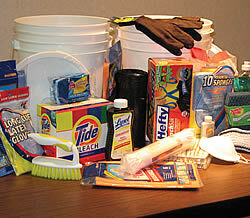 You can find information about Clean Up Kits and relief efforts at the Church World Service website. Your church will need to gather the buckets and deliver them to a local depot. (We are in the process of finding churches that can be collection points in each region. Let us know if yours may be available.) Once we have enough buckets, Church World Service will collect and transport them to their warehouse for distribution. Your church may want to take a collection for hurricane relief. Our United Church of Christ has set up a fund for the immediate and long term recovery of all those impacted by Hurricane Sandy from the Caribbean to the midwest. You can find more information here. You can also send your collections to our Massachusetts Conferenceoffice and we will gather them and send them along to our national office. Just be sure to mark "Hurricane Sandy Relief" in the memo. It is most important for volunteers to work through existing agencies and programs to ensure that the recovery efforts continue smoothly without the impact of trying to accommodate more people than they can handle. Here are some appropriate organizations and agencies to contact for information on volunteer opportunities. In the months ahead the UCC willbe setting up work group and mission trip opportunities -- we'll keep you posted. Our MACUCC weekly Emailing will include updates. We'll also be posting them on our website. Our Conference has a Disaster Resource Team that had already scheduled a meeting to review all the learnings from the disasters we have experienced here in MACUCC these last few years. You are welcome and encourged to join us in Framingham on November 7th from 5 to 8 pm as we plan for the years to come. Please RSVP to Karen Methot at MethotK@macucc.org. On behalf of all those who are the least of these in whom we find that weeping Christ, thank you for all you are doing!